What Does an Overweight Pet Mean? The rate of overweight and obese pets – about 1 in 4 dogs and 1 in 3 cats – has reached epidemic levels in the USA and Canada. The clinical definition of obesity is over 20% body fat. This condition is linked to numerous other diseases, including arthritis, diabetes, and heart disease. Short-nosed breeds like bulldogs and pugs can also develop breathing conditions due to their anatomy if their weight is not properly managed and monitored. In Canada’s Pet Wellness Report (published in 2011), Canadian veterinarians identified weight control/management as the number one thing a pet owner can do to increase the length of their pet’s life. Obesity is a disease and should be treated – it lowers your pet’s quality of life, and increases your pet’s likelihood of contracting other health conditions. The best way to prevent your pet’s obesity is to feed appropriate amounts of a high-quality, balanced pet food with an appropriate exercise program. Sometimes it is hard to recognize that your pet is overweight as the weight gain occurs gradually or it is hard to admit that your pet has more than just a bit chubby and is now fully obese. To assist in this evaluation, and remove some of the guess work, body condition scoring has been developed and is fairly easy to accomplish. There are two scoring systems: a five-point system (three out of five is optimal) and a nine-point system (where four to five out of nine is optimal). 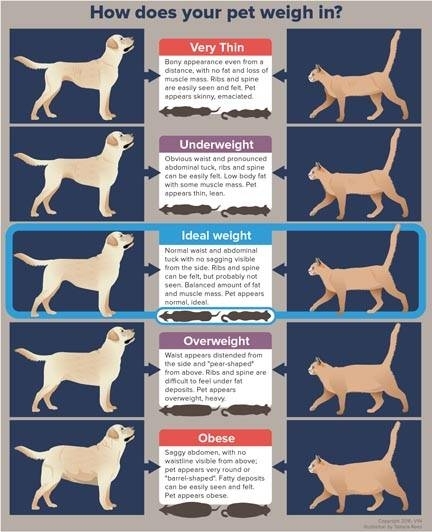 In a standard scoring system where 1 is emaciated/thin and 9 is morbidly obese, a pet is defined as overweight when scoring 6-7/9 and is obese when scoring >7/9 on the scale. On a 5 point scale a pet is considered obese when they are >4/5. To evaluate your pet, feel for a small amount of padding over the ribs. It should be possible to feel the ribs without using pressure and there should be a small tuck up in the belly where the hind legs meet the body. Extra unneeded stress on joints, including the discs of the vertebrae, leads to the progression of joint degeneration and creates more pain. Weight management alone decreases and can even eliminate the need for arthritis medications. The problem is compounded as joint pain leads to poorer mobility, which in turn leads to greater obesity. Extra fat forms a constricting jacket around the chest, making the pet less able to take deep breaths as more work is required to move the respiratory muscles. Areas of the lung cannot fully inflate, so coughing results. The pet also overheats more easily. Extra body fat leads to insulin resistance in cats just as it does in humans. In fact, obese cats have been found to have a 50% decrease in insulin sensitivity. Weight management is especially important in decreasing a cat’s risk for the development of diabetes mellitus. When an overweight cat goes off food or partially off food because of illness or psychological stress, body fat is mobilized to provide calories. Unfortunately, the cat’s liver was not designed to process a large amount of body fat. The liver becomes infiltrated with fat and then fails. A stress that might have been relatively minor, such as a cold, becomes a life-threatening disaster. A study of age-matched Labrador retrievers found that dogs kept on the slender side of normal lived a median of 2.5 years longer than their overweight counterparts. Overweight dogs don’t live as long as lean fit healthy pets do. A study released in 2001 by pet food manufacturer Purina found average life span in the Labrador Retrievers kept lean through their life (by feeding 75% of the control group diet amounts) exceeded that of control dogs by 1.8 years or a 15% longer life! The study lasted 14 years, and also found delayed onset of many chronic conditions we see in older pets. If the pet should develop a condition where a therapeutic diet is of great benefit, the pet that has been maintained primarily on a diet of table scraps may be unwilling to accept commercial pet food of any kind, much less a food modified to be beneficial for a specific disease process. This unwillingness will hamper treatment. Obesity poses an extra anesthetic risk because drug dosing becomes less accurate. (It is hard to estimate a patient’s lean body mass for drug dosing if it is encased in a fat suit.) Furthermore, anesthesia is inherently suppressive to respiration and adding a constrictive jacket of fat only serves to make proper air exchange more challenging. And still further, surgery in the abdomen is hampered by the slippery nature of the extra fat as well as difficulty visualizing all the normal structures through the copious fat deposits. One never knows when a pet will require an emergency surgery. How did my Pet get Obese without Eating that much? Food packages often have a guide to the number of cups of kibble that should be fed for certain body weights. The cup they are referring to is an actual measuring cup, such as one used in cooking. This may seem obvious but many mugs, coffee cups, scoops and other measuring devices may not be equal to a cup measure. As well, partial cups can be difficult to judge. If you do not have a proper measuring cup, please contact us as we have a variety of easy to use, accurate measuring cups for you to use. Most packages and bags of food include on the label a feeding schedule indicating how much food should be fed to pets of different weights. The problem with this is that each pet is an individual and each pet will have different metabolism. Just as one person weighing 180 lbs can be obese and another person of the same weight may be skinny, the same is true of pets. The guidelines are meant as a starting point only, and often over estimate feeding by up to 30%. If your pet becomes fat while feeding the recommended feeding schedule, you should reduce the amount of food or change to a diet that aides in weight management. You are sure you are not overfeeding but your pet still is gaining weight! Just like in humans some pets have the genes that predispose them to obesity. Dog breeds with genetic tendencies towards obesity include the: Golden Retriever, Cocker Spaniel, Dachshund, Beagle, Shetland Sheepdog, Boxer, Cairn Terrier, Basset Hound, Cairn Terrier, and Labrador Retriever. It is almost impossible to keep children from providing extra food to their pet. This often includes snacks accidently spilled during play or meal times (pets have no “five-second rule”) or purposely feeding the pet as a fun activity. Pets that roam outside (usually cats) often find food left out by friendly neighbours, either on purpose to feed their own pets or strays, or as unsecured garbage. Some pets do not burn calories efficiently; they simply have a slow metabolism. This can be genetic as mentioned previously, or in some cases it is the result of a disease such as hypothyroidism or Cushing’s disease. Testing for health problems such as these is very important to get the best treatment for your pet’s obesity. Untreated underlying disease can cause frustration and failure in your pet’s weight management. Many people express their affection for their pet by providing tasty, frequent treats, and their pet happily obliges by begging and asking for more. For some people, feeding treats to the pet constitutes a major part of the human-animal bond and they do not wish to give it up or reduce it. However, pet treats are often high in calories, and four or five treats easily equals an extra meal’s worth of added calories. Free feeding of dry food encourages the pet to snack as well; meal feeding allows for controlled calorie intake. Neutering or Spaying your pet is good overall for your pet to reduces diseases (such as infection in the uterus, and certain types of cancer), and unwanted side effects from staying intact (marking, roaming, unwanted litters), as well as it is beneficial for public health (fewer strays means fewer dog bites, less public resources needed for animal shelters etc.). However, the change your pets hormones, creates a tendency to form more fat cells (creating increased fat storage capacity), and typically slows metabolism. After neutering or spaying your pet it is important to monitor for weight changes and adjust your pets feeding schedule appropriately. The cause of your pet’s weight problem should be determined first to rule out any medical issues and to create a successful weight management plan. Start by visiting Hollybank and Avonlea Animal Hospital to get an overall health assessment and understand your pet’s unique weight management needs. Myth: I can free feed my pet and leave food out all the time. My pet will only eat as much as he or she needs. Fact: While some pets will self-regulate how much they will eat, the majority of pets will overeat their food bowl is kept full. Your pet’s daily food intake should be measured, even if you are not formally meal feeding. Your veterinarian can help determine the appropriate amount to feed your pet to maintain a healthy weight. Dogs and cats will eat strictly for the joy of eating, not realizing the health risks they are subjecting themselves to in their overindulgence. Monitoring a pet’s eating habits and keeping them as healthy and happy as possible is your responsibility as the owner. Myth: Human food including steak, and cheese are fine for me, so they must be fine to feed my pet. Fact: The excessive amounts of fat and calories in human foods can easily lead to obesity. Small human food ‘treats’ are likely adding more calories than you realize to your pet’s daily intake. Fact: The portions indicated on pet nutrition labels are guidelines, based on an average pet. Individual pet needs may vary by as much as 25%. The portions indicated on labels are based on the number of 8-ounce cups to be fed. Control what your pet eats. This is easy enough with only one pet and roaming is not allowed, but trickier if there is more than one pet in your home. Use your ingenuity to feed your pets separately. Be determined to stick to your pet’s diet plan. Stop expressing love for your pets by constantly offering treats, and use lower- calorie treats such as carrots. Carve out some time out in your schedule to walk your dog or play with your cat — three times a week, at least, daily if possible. Exercise has an added bonus: In addition to keeping your pet healthy, regular activity helps to correct many behaviour problems caused by boredom. Commit to regular weigh ins. Know what the goal weight is and how long it should take to reach this goal/or how to tell if the pet is on target. It is important not to try to go too fast. If the weight loss is not on track, sometimes it is necessary to feed more rather than less. Your veterinarian can contact the clinical nutritionists at the pet food company so as to make the best recommendations. Yes, it’ll be hard in the beginning, what with those begging eyes and all. But don’t give in. Your pet’s life will be happier and longer if he’s kept fit. Please View our Individual Weight Management Guides Specific for your dog and cat for an in depth Weight management Plan. Congratulations on making a healthy choice for your pet! Enclosed in this folder is information to help your pet with a successful weight loss program. Actually creating and sticking to a weight management plan for your dog or cat can be a daunting task, which is why we have prepared the following pointers to help you get started and keep you motivated along the way. Weight for your pet, but will also prescribe the right weight loss food, and provide you with advice and tips for success. We will ask you to drop by for a regular weight check-up and we will help you stay motivated until your pet has reached his or her healthy weight. We will then help you determine the right diet to maintain the healthy weight of your pet after the weight loss program. How long will it take for your cat to achieve his or her ideal weight? Cats are as unique as humans in the way that they loose weight. Most cats will start to loose weight after 4-6 weeks and should aim for no more than 0.5lbs of weight loss per month. It is important that cats loose weight slowly to allow their bodies to adjust without starving, or leading to a liver condition called hepatic lipidosis. It will normally take 6 to 12 months to achieve a target weight for your cat. Regular weigh-ins are important as your pets diet and amount fed may be adjusted depending on his or her response. Why can’t I just feed less of a regular diet? This sounds simple but in fact when one simply tries to cut back on food, it just does not seem to work. By directly cutting back on food, you are cutting back on the nutrients the pet needs. Regular diets are designed for cats of average body weight with average energy requirements. They are not formulated to provide all the essential nutrients when reduced calories are fed. Should I feed wet or dry food? Although Weight loss diets are available in a variety of formats, it is important to find a diet that your pet will enjoy. Due to high moisture content in canned diets, these diets can often achieve faster weight loss while providing a more satisfying volume of food for your cat than a dry diet alone. Canned diets are also usually higher in protein and lower in carbohydrates which can aid in healthy weight loss with your pet. It may be more difficult to feed a wet only diet, and often a mix of both wet and dry will be recommended. Be sure to slowly transition your pet to his or her new food over a 5 to 7 day period. Changing quickly may lead to poor acceptance of your pet’s new diet and may also cause gastrointestinal upset. Feeding multiple meals will help to alleviate hunger and help to increase energy expenditure. Control what your pet eats. That’s easy enough if there is only one pet and roaming is not allowed, but trickier if there is more than one pet in the home. Use your ingenuity to feed your pets separately. Can I feed my Cat treats? A small amount of treats can be continued as part of your daily routine if low calorie options are utilized. The Feline Satiety Treats are highly palatable, low calorie treats (only 1.5 kcal per treat), and are suitable to be used in moderation in a weight loss program. Treats of any kind should not make up more than 10% of your pet’s daily caloric intake. What happens after my pet has achieved his or her target weight? Once your pet has reached his or her target weight, their weight can be maintained by feeding a diet with moderate calorie restrictions. Cats that have lost weight will still have a lower calorie requirement to maintain their current weight compared to cats that have never been obese. Feeding a high quality diet, restricting caloric intake (including treats and human food) and increasing activity are the most successful methods for weight loss in dogs and cats that are otherwise healthy. Nutrition consults with a veterinarian and pet food specially formulated for weight loss, can aid in reaching a healthy weight. An increase in protein to minimize lean tissue loss. Extra protein may also help your pet feel fuller. An L-carnitine supplement, which helps maximize the amount of fat and minimize the amount of lean tissue lost during weight management. The addition of fiber which allows you to feed your pet a greater volume of food without adding calories. Satiety Support: Contains a unique Blend of fibres, with high water binding capacity fibres. The specialized fibres are clinically proven to provide a satietogenic effect, to reduce begging behaviour. This food is high in fibre and protein with reduced calories to aide in weight loss. The S/O index helps to support bladder health and prevent urinary crystals. Satiety Support is formulated with l-carnitine (which metabolizes fat for energy, helping to preserve lean muscle), supplemental omega 3 fatty acids (EPA and DHA) and glucosamine and chondroitin (to support joint health and reduce inflammation). Calorie Control: Contains moderate fibre, high protein and reduced calories to aide in weight loss. It is formulated with L-carnitine (metabolizes fat for energy, helping to preserve lean muscle, s/o index (support urinary health and prevent urinary crytals), supplemental omega 3 fatty acids (EPA and DHA), glucosamine and chondroitin (supports joint health and reduces inflammation). A combination of vitamin A, biotin, chelated zinc promotes healthy skin and luxurious coat. Contact your veterinarian today to discuss the best diet for your pet’s weight loss journey. The exact amount you should feed your pet depends on the diet being fed, your pet’s activity level and ability to exercise. The calculations are based on your pet’s target body weight and Body Condition Score (BCS), not their current weight. It is important to remember that the feeding amount provided by your veterinarian is only a starting point. If weight loss slows, or your pet is not achieving their weight loss goals in a reasonable amount of time, the amount of pet food may be decreased in increments of 5-10 percent. In general, the recommended rate of weight loss for your pet should be 1/2 to 1 percent of body weight per week but this should be specifically tailored to your pet’s individual needs and should not exceed more than 0.5lbs of weight loss per month for cats. It is not recommended to simply follow the manufacturer feeding guidelines on the diet without first consulting your veterinary medical team. These are guidelines that are developed for the needs of the average pet. The true needs of the individual pet can vary by as much as 25 percent depending on their breed, body composition, environment and activity level. The amount of food you should feed your pet depends on many different factors. In general, you should consider your pet’s species, breed, size, body composition, age (life stage), activity level and environment. Foods have different calories and nutrient densities so the volume of food needed can vary widely among various brands. To make the most positive impact, food must be measured precisely. Food can most accurately be measured by weighing, preferably with the use of electronic scales. The next best method is to use a specialized measuring cup, provided by your veterinarian clinic. Remember not to feed your pet additional foods such as table scraps and treats. Healthy treats should make up less than 10% of your pets overall daily caloric intake. Talk to your Veterinarian to discuss the ideal weight loss diet for your pet today! My Cat doesn’t want to play- how do I encourage him or her? Toys that have rapid, unpredictable movement or high pitched sounds are an excellent choice for your picky kitty! You can also hide a very small amount of food or a treat around the house to encourage your cat to exercise. Using a laser pointer to lead to a small treat can help to train your cat to follow the laser. As your pet learns that there is a treat when he or she follows the laser you can gradually increase the ‘route’ to the treat. Placing the water and food bowls on different levels of your house will encourage your cat to exercise more frequently. Food puzzles, or toys that release a small amount of food as your cat plays with them are a great way to encourage exercise and slow down your cat’s eating. Cat’s are used to hunting for their food, and encouraging them to exercise for it is a great way to help with their weight loss. Consider interactive toys that can be used when you are not home or where your own participation is minimal. Cat’s tend to prefer frequent, short play sessions. Try starting with a 1-2 minute play session 1-2 times per day and gradually work up to longer, more frequent sessions. You may encounter a few problems during your pet’s weight loss program including difficulty in your pet adapting to the new diet or reduced amount of food; behavioral problems related to this, with excessive vocalizing, aggression and/or stealing food or an unexpected slow rate of weight loss. If your cat is constantly begging for food using feeding toys such as the Slim Cat will help your cat to feel fuller by slowly down their eating time and increase exercise. Automatic feeders also help to train your cat that you are not directly provided them food, which often leads to less vocalization and begging. Your veterinarian will supervise your pet’s weight management plan. Your pet’s progress should be closely monitored and rechecks should take place every two to four weeks. Your veterinary medical team will provide you with feedback, encouragement and support. Remember, not only is weight loss important, but adopting a healthy lifestyle is equally beneficial. Once your pet has reached the target weight, continue with regular rechecks. Your doctor will help select a maintenance level to keep your pet’s weight stable. weight for your pet, but will also prescribe the right weight loss food, and provide you with advice and tips for success. We will ask your to drop by for a regular weight check-up and we will help you stay motivated until your pet has reached his or her healthy weight. We will then help you determine the right diet to maintain the healthy weight of your pet after the weight loss program. How do I know if my dog’s weight loss program is working? Frequent weigh ins are an important measure of success for a weight loss program. Dogs are as unique as humans in the way that they loose weight, and feeding amounts may be adjusting depending on your dog’s response to his or her diet. Between weigh ins there are a number of signs that indicate your weight loss program is successful; You may notice your pet: has an easier time getting up from the sitting position, is able to climb more stairs without hesitation, is more active or playful throughout the day, or has improved skin and coat quality. How long will it take for your dog to achieve his or her weight loss goal? Each dog is as unique as humans, however, a slow gradual weight loss is recommended. Your pet’s target weight will normally take 6 to 12 months to achieve. Regular Weigh ins are important to track your pet’s progress and to allow for dietary adjustments as required. My dog is being fed the prescribed weight loss diet but is still gaining weight; What is going on? If your dog is unsuccessful with his or her weight loss program it is important to ensure that no underlying medical reason exists. To ensure this, often bloodwork is required to assess for hypothyroidism or Cushing’s disease, both of which can contribute to weight gain. Use a measuring cup to accurately measure each meal- even an extra kibble or two can add to your pet’s waistline! If several people in the household participate in feeding your dog, ensure that the total amount fed per day (including treats) does not exceed the daily maximum caloric intake. This can be done by placing the total amount of food for the day (including treats) into a separate container each day. Ensure your pet is on an appropriate weight loss diet, discuss with your veterinarian the right amount to feed. This sounds simple but in fact when one simply tries to cut back on food, it just does not seem to work. By directly cutting back on food, you are cutting back on the nutrients the pet needs. Regular diets are designed for dogs of average body weight with average energy requirements. They are not formulated to provide all the essential nutrients when reduced calories are fed. My dog always seems hungry, is he getting enough to eat? Your dog’s weight loss program has been formulated for your individual dog. Begging or crying can be common roadblocks to achieving weight loss. By feeding smaller frequent meals your pet will feel more full on less. Never reward you pet for begging or crying, this will re-affirm your dog’s behaviour. Instead remove them from the situation, placing your dog in another room before doing an activity that triggers this behaviour (such as staying out of the kitchen during meal preparation or eating). After doing this consistently for a few weeks, the begging should stop. Recent studies of Chocolate labs show that they their hunger signals are genetically faulty; with their bodies always craving more food. Satiety Support: Unique fibre blend in Satiety Support is formulated to decrease begging. This diet is formulated to be high in fibre and protein, with reduced calories, to promote safe and successful weight loss; It contains supplemental omega 3 fatty acids (EPA and DHA) and glucosamine and chondroitin (provides joint support and reduces inflammation). Satiety Support Small Dog: This diet is formulated with special fibre blend specifically for small dogs to decrease begging. It is high in fibre and protein with reduced calories to aide in weight loss. The Satiety Support Small Dog has controlled minerals to achieve the S/O index (reduces the risk of bladder crystal and stone formation, a common condition in small dogs), and contains tartar reducing ingredients (decreases tartar accumulation common in small dogs). Calorie Control: This diet contains moderate fibre, high protein, and reduced calories to help your dog achieve successful weight loss. It is formulated with supplemental L-carnitine (helps body use fat for energy), supplemental Omega 3 fatty acids (EPA and DHA), glucosamine and chondroitin, and a combination of vitamin A, biotin, cheated zinc and omega 3 and 6 fatty acids. Talk to your veterinarian today about the best diet for your dog. The exact amount you should feed your pet depends on the diet used, your pet’s activity level and ability to exercise. The calculations should be based on your pet’s target body weight and Body Condition Score (BCS), not current weight. It’s important to remember that this is only a starting point. If, for example, weight loss slows, or is not being achieved in a reasonable time frame, the amount of food may be decreased from 5-10 percent. In general, the recommended rate of weight loss for your pet should be 1/2 to 1 percent of body weight per week but this should be specifically tailored to your pet’s individual needs. It is not recommended to simply follow the manufacturer feeding guidelines on the diet without first consulting your veterinary medical team. Your veterinarian will be able to provide you with individual feeding amounts tailored to your specific pet. The true needs of the individual pet can vary by as much as 25 percent depending on their breed, body composition, environment and activity level. The amount of food you should feed your pet depends on many different factors. In general, your veterinarian will take into account your pet’s species, breed, size, body composition, age (life stage), activity level and environment. Foods have different calories and nutrient densities so the volume of food needed can vary widely among various brands. Treats are generally high in calories and the amount of treats that your dog or cat receives should be limited to less than 10 percent of their daily caloric requirements. When giving your pet treats, the amount of food fed each day should be reduced accordingly by 10 percent. Healthy treats can include apples (50g, 1 apple, 26 calories), cucumbers (50 grams, 8 calories), carrots (50 grams, 20 calories). Unhealthy treats can add up quickly and includes Timbits (old fashioned glazed 70 calories), cheese (30 grams, 120 calories), peanut butter (1 tbsp, 92 calories), hot dog (37 grams, 100 calories). Remember, unhealthy treats can add up very quickly! A 30g piece of cheese represents 38% of a 5kg dogs TOTAL daily energy requirements. 1 tablespoon of peanut butter is 10% of a 20 kg dog’s total daily energy requirements. Talk to your veterinarian today to discuss the best weight loss diet plan for your dog! What is the best way to introduce an exercise program to my dog? Start slow. It is best to start any exercise regime slowly and work up to the desired routine. Small amounts more frequently leads to a more consistent, stress free exercise program. ‘Weekend warriors’ are more prone to injury. Signs that your dog is tired and he or she should be allowed a rest include laying down, stopping, lagging behind you, or excessive panting. Be sure to always bring extra water in the summer, and stick to early morning or late night walks to avoid heat stroke! Start by going for a 5 to 10 minute walk twice daily and slowly increase to a jog or playing fetch in the park over 1-2 months. What are good activities for my dog? Walking is a great way to increase your dogs exercise. Try choosing the same time every day and gradually increasing your route. Swimming is one of the best forms of exercise for your dog, as it places minimal stress on joints. Playing fetch with appropriate toys is another easy way to encourage more activity in your pet’s life! For dogs, exercise may include lead or off-lead walking, games such as Frisbee or fetch, swimming/hydrotherapy and using a treadmill. More exercise with your pet can help slow the loss of lean body mass as your pet ages, as well as help prevent a rapid regain in weight after successful weight reduction. For your dog, the exercise program must be individually tailored just for him or her, taking into account any medical conditions or limitations, as well as the athletic capabilities of your particular pet. Some dogs will be comfortable doing activities that others are not, which often depends on the breed, health, and age of your pet. You may consider something simple like lead walking, treadmill exercise, or jogging, or some more off-leash activities, such as swimming and hydrotherapy. If you have any questions on concerns please feel free to contact us! Good Luck! You may encounter a few problems during your pet’s weight loss program including difficulty in your pet adapting to the new diet or reduced amount of food; behavioral problems related to this, with inopportune vocalizing, aggressiveness and/or stealing of food or an unexpected slow rate of weight loss and side effects of drug therapy (if used). Your veterinarian should supervise your pet’s weight management plan. Your pet’s progress should be closely monitored and rechecks should take place every two to four weeks. Your veterinary medical team will provide you with feedback, encouragement and support. The most successful approach for helping your pet lose weight is no secret: reduce calories, increase activity. When it comes to safe, healthy weight loss, exercise is just as important as a balanced, calorie-controlled diet. Work with your veterinarian to develop the ideal weight loss plan for your pet.